Martha Graham, the Great American dancer and choreographer, urges us to give full expression of our unique selves as an eternal gift to humanity. Sometimes we just need somebody to tell us something true. To show us that we have a place in the great line of humanity. To give us the permission to express ourselves fully for the betterment of our selves, our loved ones and the world. 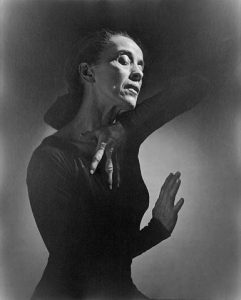 Martha Graham was an American dancer and choreographer, who died 28 years ago this week. She is cited with powerful little quotables such as “Practice is a means of inviting the perfection desired”, or “The only sin is mediocrity”. But it is her message about how to live life through expression of our unique innermost selves that speaks loudest. It was delivered to Agnes de Mille, herself a choreographer who rose to fame following the success of the stage musical Oklahoma! in the 1940s. “I confessed [to Martha] that I had a burning desire to be excellent, but no faith that I could be,” said de Mille. Martha said to me, very quietly: “There is a vitality, a life force, an energy, a quickening that is translated through you into action, and because there is only one of you in all of time, this expression is unique. “And if you block it, it will never exist through any other medium and it will be lost. It is your business to keep it yours clearly and directly, to keep the channel open. You do not even have to believe in yourself or your work. You have to keep yourself open and aware to the urges that motivate you.